If you have a Larchmont Library card, you can visit museums in Westchester, Manhattan and Connecticut by reserving a Museum Pass at the library! For details, CLICK HERE. Your Larchmont Public Library card gives you access to seventeen museums throughout our area. Reserve a pass today on our Museum Pass page. 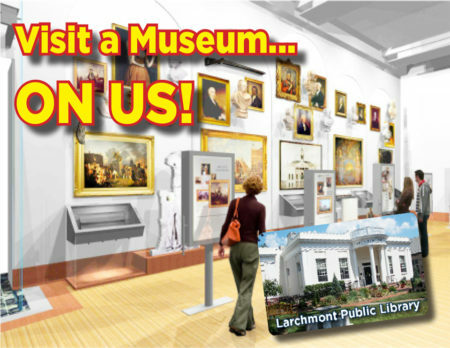 Our Museum Pass Program is made possible by the Friends of the Larchmont Public Library.